you) to participate in some theme party- in costume or toga party, where you obviously need a certain type of clothing, and the location and organization are perfect, just because the theme cannot be ruined. It's definitely a special event that in many cases allows you to unleash your imagination in terms of style, even if the theme isn't very customizable you always try to give your own interpretation, perhaps adding details, but at the same time trying to be careful not to go too far from the "character" or theme. 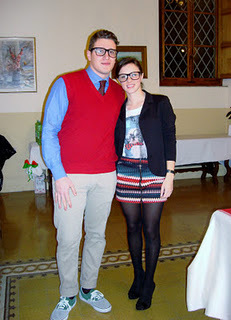 Last week I attended a graduation party, that was also a theme party; the theme was nerd! In my opinion it was an apt choise because because the graduate had just gotten his degree in mechanical engineering, and it was organized very well since the motto of the evening was: " Engineers do not live, they WORK!" Therefore I, as all the other partecipants, had to adjust to the requirements to partecipate. Thinking about the nerdy style, the first things that come to mind are the big goggles, high-waisted pants (for men), knee-lenght skirts with extravagant colors, the shirt tucked in the pants that can be checkered or not- but in my opinion the checkered shirt for the nerdy-style can't be the shirt you would normally use, but a flanell shirts, or with a pattern, always checkered or squared, but it has to be tacky- vests, cardigans of unual colors, and here's an important thing, you don't have to match all the colors perfectly. 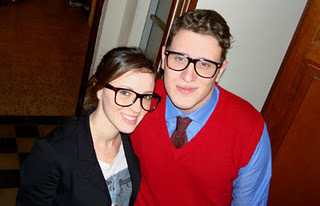 The accessories have a key role in the nerd-style, because they change the hole outfit: a normal outfit with the right accessories can easily become a nerd-outfit! The must-have accessories are the glasses, that can be easily found even by those who don't really need them, like in H&M (they are really cheap too), other accessories are the suspenders that always have to be coordinated to the tie or bow if you wear one. It would be important, where possible to also watch the hair styling: braids or ponytails for the girls and a lot of gel or wax for the guys. To conclude, here's a picture of me with my girlfriend taken at the party. The choise to avoid the checkered shirt and the vest was made of fear that all the partecipants would wear one (in fact they did!). They all wore the same tipe of clothes: checkered shirt and suspenders! So tell me what you think and if have any suggestions about this, I maybe happen to reuse them in some other similar event.